Download Flappy Owl Pt9 - The Game Sheet. In this part of the tutorial we'll create a new class to represent our game sheet object and finally upgrade our basic test worksheet into something which looks more like the final game sheet. Resize the rows and columns. Divide the sheet into three separate areas for the titles, floor and game. Change the colour of the three areas and add borders to separate them. When the game ends we'll need to delete the sheet that has been created to avoid littering the workbook with old game sheets. We'll create a separate class to represent the game sheet, mainly to avoid cluttering up the module which contains the rest of the game code. Insert a class module and rename it in the usual way. Insert and rename a class module. We've made these variables public so that code outside of the class will be able to access them. We could have created complete property procedures to achieve the same result but this is a quicker and easier way to do it. This type of variable is referred to as a field of the class. Each of these values can be changed by other code after we create a new instance of the class but these numbers provide us with a sensible starting point. Now we can start filling in the details. The first task that we'll tackle will be to set the rows and columns of the game sheet to the correct sizes. Due to the astonishingly convoluted way in which columns widths are specified in Excel we'll actually do a few parts of this process manually. Head back into Excel and insert a new worksheet. Rename the sheet as CellSizes. This worksheet will be used to hold the various cell sizes that our game might use. Remember that range names can't contain spaces. Don't forget to press Enter to create the range name once you've finished typing. Now that we've named the cells we need to resize them to the dimensions indicated by the range name. We'll do this by clicking and dragging the columns and rows to the correct size. This will be easier to do if you zoom the view (hold CTRL and roll the mouse wheel forwards to do this quickly). Click and drag between the column headings to change the width. 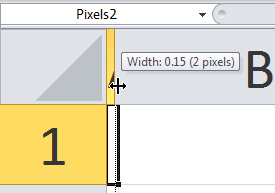 Use the tooltip to help you set the column to the correct width in pixels. Unbelievably, there's no direct way to write code to do this. The four cells highlighted here should be perfectly square. I've only coloured them in to make them easier to see; you don't need to do this. Rename the sheet in the usual way. Run the subroutine and check that the new worksheet is created with the correct cell size (you can delete the sheet once you're happy that it works). You could also try changing the range name used to set the SizeCell variable to make sure that you can create sheets with different cell sizes. Once you've done this you can run the TestCreateGameSheet subroutine again to make sure that your sheet appears without gridlines or row and column headings. With gridlines and headings. Without gridlines and headings. The game sheet consists of a title area on the left where we'll display things like the score, a game area where the bird and obstacles will appear and a floor area at the bottom. All of these areas are surrounded by borders. There are several colours on the game sheet that we'll need to refer to multiple times and which we might want to use later on in the project. It makes sense at this point to spend a little time defining the colours that our game will use. We're only going to define colours for these four items for now: the borders; the title background; the sky background; the floor background. To make them easier to use we're going to store the values for these colours in constants in our code and, because the set of constants will be related we're going to group them together using an enumeration. This declares four constants within an enumeration called GameColour. The data type of each item in the enumeration is a long integer. By default the first item in the enumeration is assigned a value of 0, the second is 1, and so on. We want our constants to store the value of the colours that their names suggest. To find out what these values are we'll manually colour in some cells in a worksheet and use some simple code to return the number of the colour. Type the name of the colour in the cell next to the coloured one. 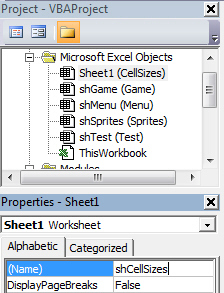 Now head back to the Visual Basic Editor and rename the worksheet that you've created using the Properties window. Rename the sheet in the usual way. I've called mine shGameColours. The loop that we've added checks if the active cell contains any value. If it does then it prints the value of the colour to the Immediate window and moves down to the next cell. It keeps repeating these actions until the cell in column B is blank. Run the subroutine and then open the Immediate window to see the result. From the menu choose View | Immediate Window or just press CTRL + G.
The Immediate window will show you the actual value for each colour you've chosen. Your numbers may be different to the ones I've chosen. Now we need to use these colours to set the values of the constants in our enumeration. Go back to the modPublicDeclarations module and change the enumeration so that it looks like the code shown below. You can copy and paste the text from the Immediate window rather than type it in. Now we can get back to creating our game sheet. The OriginRange variable is probably a little unnecessary here, but it will help us if we decide to change where our game regions sit on the sheet later. Now for the top border. Its origin will be cell A1. Its height will be the same as the BorderWidth variable. Its width will be the same as three border widths plus the title area width and the game area width. The bottom border will have the same height and width but it will be offset down by the width of a border plus the game area height plus the floor area height. At this point it's probably worth testing that the current code works. Go back to the CreateGameSheet subroutine and add a call to the DrawBordersAndRegions procedure below the appropriate comment. Now go back to the modTestCode module and run the TestCreateGameSheet procedure. The game sheet should be neatly divided into separate areas. The important thing here is that as well as colouring in the title region we set a reference to the range in the public variable called TitleRange. This will allow code outside of the class module to reference this area when the game is running. We'll need to do this later in the project when we want to do things such as display the score in the title area. Again, it's important that we set a reference to the game region so that later code can refer to it. It looks basic but all of the game regions are clearly defined. This will successfully create a new game sheet when the game starts but, unfortunately, that's not where our Owl will appear. The code in the class module which defines the bird still refers to the test worksheet. We've still got some work to do to make everything work. When we create a new instance of our bird class it needs to know which cell on the new game sheet to start on. When its update method is called the bird needs to know where the floor is and also in which new cell to draw itself. We have a variety of choices as to how we could accomplish this but I think that the simplest is to pass a reference to the entire game sheet to the new instance of the bird just after it is created. 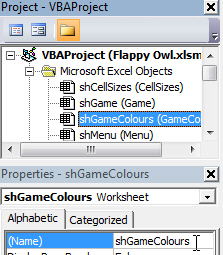 If we were using a language other than VBA this would be the perfect time to write a constructor for the bird class with a parameter which would accept an object of the game sheet class. We've previously seen the Property Let procedure for creating basic data-type properties. We use Property Set when the property refers to an object. The code positions the bird halfway down the game area and 40 cells in from the left hand edge of game area. It also sets the FloorRange variable to refer to the first cell within the floor area of the game sheet. Notice that we need to use the Set keyword here because the property refers to a class of object, not just a simple data type. 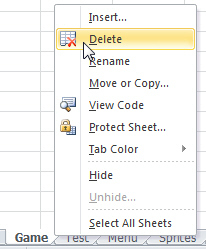 Head back into Excel and on the menu sheet click the Start Game button. You should see a new game sheet is created and the bird is drawn in the correct place. Check that you can move the bird up and down and that you can end the game by pressing TAB. There are, of course, several improvements that we need to make. Firstly, the bird image is surrounded by cells with no fill colour so we need to make these the same colour as the game background. Secondly, when our game ends the game sheet is left behind so we want to make sure that it gets deleted. We don't really want to see the white box around the bird. Notice that we test the ColorIndex property but change the Color property. Run the subroutine and check the Sprites worksheet to make sure the that bird is surrounded by blue cells. The cells that weren't previously coloured should now be blue. We'll use the destructor of the game sheet class to make sure that the game sheet gets deleted when we end the game. Go back to the clsGameSheet class module and use the drop down lists at the top of the code window to create the procedure. Choose Terminate from the drop down list on the right. Time to test the game once more: head back to Excel and click the Start Game button. This time the image should appear without white cells surrounding the bird and, when you end the game, the game sheet will be deleted automatically. Right at the start of the project we created a worksheet called Game. We don't need this sheet any longer so it's time to delete it. It's easiest to do this manually in Excel. As our code automatically generates our game sheets we don't need this one any longer. Right-click on it and choose to delete it. If you find that any of the code doesn't work you can download the working version of the workbook from the top of this page. The bird can now fly up and down in the game sheet but currently doesn't have any obstacles to avoid. The next part of the tutorial will show you how to add these obstacles into the game.